There’s quite a bit of folks that just got done freezing in the snow for 5 days to see some of their favorite Red Dirt and Texas Country music, and part of me is a bit jealous but part of me thinks brrrrr. Well the folks at OhWook! Productions have another type of atmosphere and weather in mind for their own inaugural music festival, and I think they just might be on to something. 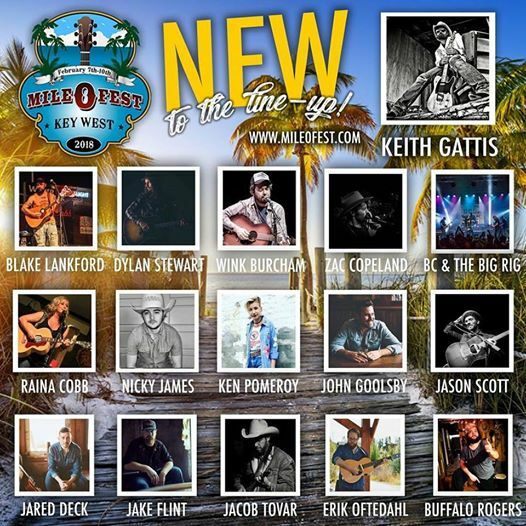 The Mile O Fest, which will be held February 7-11 2018 at the new Truman Waterfront Park Amphitheater in Key West Florida, is shaping up to be the premiere destination Red Dirt/ Texas Country Music Festival. The well rounded line up of artists is almost overwhelming. The thought of all your favorites lined up in one place, a place with sandy beaches and an average temperature of 75 in February, is enough to make any music lover swoon. Let’s talk about that lineup for a minute. Turnpike Troubadours, Cody Junks, Pat Green, Wade Bowen, Shooter Jennings, Charlie Robison, William Clark Green, Bruce Robison, Jack Ingram, Old 97’s, Stoney LaRue, Ray Wylie Hubbard, Jason Boland and the Stragglers, Shinyribs, The Black Lilies, Cody Canada and the Departed, The Great Divide, Jason Eady, John Moreland, Red Dirt Rangers, Mike and the Moonpies, Dalton Domino, Brandon Jenkins, Carter Sampson, Uncle Lucious, Bri Bagwell, and that’s not even all of it. Seriously, they pretty much have everyone that is anyone in the Red Dirt and Texas scenes. As if the location and weather wasn’t enough to draw you in, they really knew what they were doing when they padded the roster of musicians as well. There’s of course the main stage and several other venues so you can hop around and see a variety of different acts, although from the looks of it you are going to wish to be in all the places at the same time. What I’m most excited about, are my friends and local acts that are on the bill as well, like Kaitlin Butts, Ken Pomeroy, Raina Cobb, Buffalo Rogers, Dylan Stewart, Jake Flint, John Goolsby, Blake Lankford, Erik Oftedahl, Wink Burcham, Jacob Tovar, and BC & The Big Rig. Well done friends, I’m excited to see these guys get to travel with such an impressive music fest and line-up and get the opportunity to introduce their music to a whole slew of new people in a new place. I might be a *little* biased, but I think Oklahoma has some red dirt magic when it comes to musicians and songwriters, and I believe we have the cream of the crop. So it’s extra special to me to see all of these amazing Okie folks get to be a part of something so big and impressive. Now Key West is part of the Florida Keys archipelago. It's also Florida's southernmost point, lying roughly 90 miles north of Cuba. Famed for its pastel-hued, conch-style houses, it’s a cruise-ship stop also accessible from the mainland via the Overseas Highway. It’s known more for its coral reefs – destinations for diving and snorkeling – than for its beaches. From snorkeling North America’s only living coral reef to rugged off-roading to crawling your way through Duval Street’s wild nightlife, there’s definitely something for everyone there though. There’s also Golf and Fishing Charity Benefit tournaments happening during the festival, for those that want to mix some leisurely hobbies with their music intake. 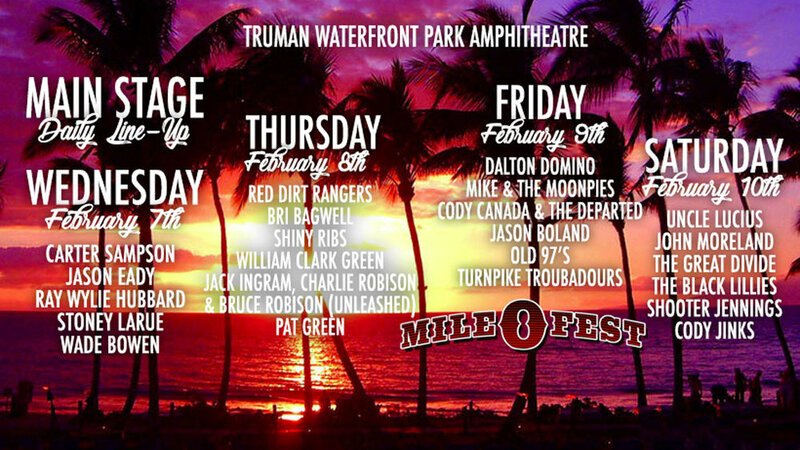 They will benefit Red Dirt Relief Fund, The Michelle Halpam Foundations and the Bahama Village Music Program. The Golf tournament is $175 per person or $700 per team, which includes the green fees, cart, box lunch, swag bag and 3 raffle tickets for giveaways. The tournament will be a four person scramble and there will be 1st, 2nd and 3rd place winners. The Fishing Derby is $200 per person or $1200 per boat. IGFA rules and tackle specifications apply, and Celebrity Judges will determine the winners for the fun categories such as biggest fish, ugliest fish and most unique fish. You can still snag yourself a 4 day pass for the event for $325 or even single day passes for $75-95. Or you can get an all inclusive package deal, with a four day pass, 5 nights accommodations, $100 excursion credit with Fury Water Advdentures, and a Mile 0 Fest Swag bag starting at $745 per person. It’s shaping up to be the musical festival of all music festivals and you still have time to be a part of it’s maiden voyage. You can find out more information on their website at www.mile0fest.com.